Queen Victoria of England 1819-1901. In the painting on the left: Queen Victoria and Prince Albert; on the right: Queen Victoria, Edward, Prince of Wales, and Alfred, Duke of Saxe-Coburg and Gotha. Alexandrina Victoria of Hanover was the only child of Prince Edward, Duke of Kent and Strathearn (who was the 4th son King George III of England), by his German wife, Princess Victoria of Saxe-Coburg-Saalfeld. After her father and Grandfather died in 1820, she became heir presumptive, next to her last surviving and childless uncle, William IV. Growing up, Victoria was smothered by her over protective mother, and her ambitious and controlling comptroller, Sir John Conroy. Things were so extreme that Victoria was not even allowed to descend the stairs of her own home alone and she was forced to share a bedroom with her mother. (One of the first things she did upon the death of the King, was to have her bed and belongings moved into quarters of her own. Sir John intended to use Victoria as his puppet when she ascended the throne. When she fell seriously ill he tried to bully her into officially making him her private secretary. She resisted. William IV died in 1837 and Victoria was Queen. She was not the weak girl Conroy and her mother tried to make her and she banished Conroy from her sight. In 1836, Victoria’s mother’s brother, Leopold I, King of the Belgians, sent his nephew, Prince Albert of Saxe-Coburg and Gotha, to England to court his niece. However, when William IV was still alive, he desired a match between Prince Alexander of the Netherlands, the second son of the Prince of Orange. Victoria was a valuable match for any of Europe’s finest elite and eligible bachelors… However, she fell in love with Prince Albert, so none of the others stood a chance. By the time William IV died, Victoria was 18. This was a good thing, as a regency was avoided. Most likely a regency would have been turned over to Victoria’s mother, and her mother was controlled by Conroy. The United Kingdom at this time was already a constitutional monarchy and the government was led by Whig prime minister Lord Melbourne. Melbourne became Victoria’s chief adviser. In 1840 the Queen married Prince Albert. Ironically she will arrange and force marriages on all her many children and grandchildren, yet she was fortunate to be in love with her spouse before she decided to marry him. Albert would only be granted the title of Prince Consort, aside from military rankings, and honors bestowed upon him by the Queen. Nine children and forty-two grandchildren came of their marriage, even though Victoria was to have openly said that she hated being pregnant, and thought babies were ugly. With her youngest son Leopold, she mentions him quite often in her personal writings, about how much he bothered her, starting with his ugly little face at birth. One can’t help but wonder if Victoria had some dry and sometimes mean sense of humor, as she had enough babies, doing more than her duty as Queen. Another interesting fact about Queen Victoria is that even though she was well liked and loved by her people,she met with several assassination attempts throughout her reign. One of the Queen’s foreign policies was to improve relations with France. A British monarch had yet to meet with a French one since Henry VIII and Francis I on the Field of the Cloth of Gold. In fact, England would welcome King Luis Philippe I of France when he fled in exile during the Revolution of 1848. Eventually her children married and had children of their own. Victoria saw to it that her family was attached to almost every important family in Europe. 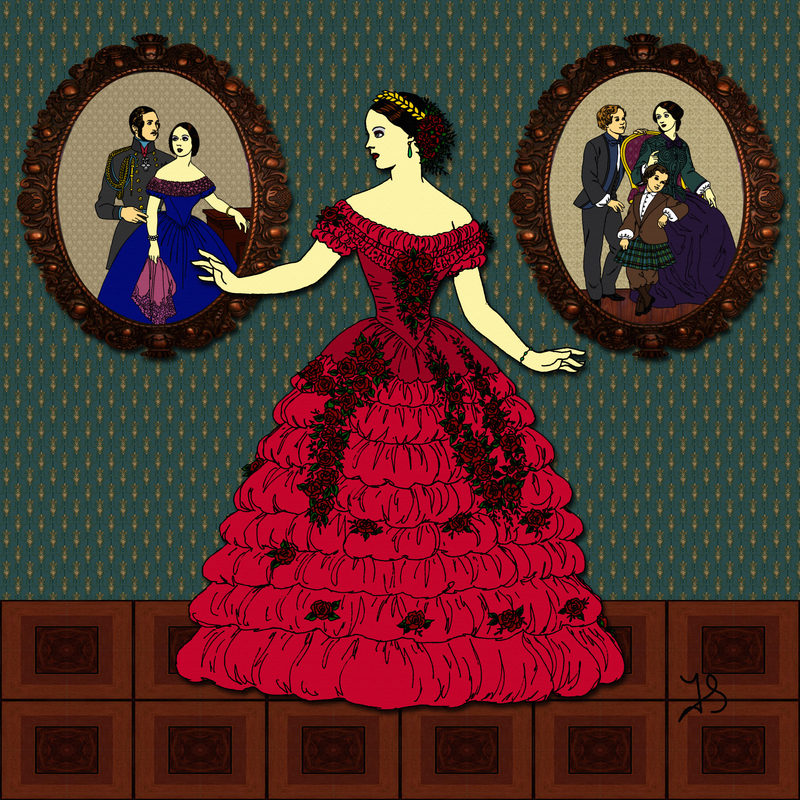 On 14 December 1861, the love of her life, Prince Albert, died of typhoid fever. It was then that she entered a permanent state of widowhood for the rest of her life. She avoided public appearances when ever she could, and became known as the Widow of Windsor. Her self-imposed isolation and the foolishness of her son Edward VII diminished the popularity of the monarchy and encouraged the growth of the republican movement, Victoria was the first British monarch to be styled as Empress of India. At the end of her reign, Victoria’s full style and title was: “Her Majesty Victoria, by the Grace of God ,of the United Kingdom. of Great Britain and Ireland Queen, Defender of the Faith, Empress of India.” Her reign of 63 years, longer than any other British monarch, and the longest of any female monarch, is known as the Victorian Era.